I hardly ever make rolls and I don’t really have a good reason why. They’re awfully good and a nice complement to most meals. But I always make them for Thanksgiving and other holidays, so maybe I just need to consider any dinner a special occasion. You can use just about anything to top these little rolls. I went with poppy and caraway, but sunflower seeds would be great too, as would minced dried garlic or onion, even a mix of all four (or five!) like my favorite “Everything” bagels. The sky’s the limit with these and no one says you couldn’t knead in a bunch of seeds too. Now, I’ll be honest here. Even though these came out really well, they could have been better. Here’s what I did wrong — and what you should do right. * I brushed the rolls with melted butter midway through the rise. (Actually, it was the end of the second, but then I found out there wasn’t enough room in the oven for them, so I let them continue rising for another 30 minutes.) But I couldn’t brush them again because I already sprinkled seeds on. Oops! * I didn’t sprinkle on anywhere near enough seeds. Nor did I knead in any because I forgot. * I didn’t knead them long enough, so they were denser than I’d like and forming them into balls wasn’t as easy as it could have been. Still, despite all of those faults, they came out really well. 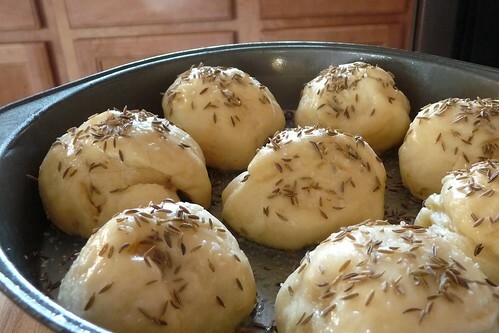 I’m seriously considering some variations on these for future dinners because I really ought to make rolls more often. In a large bowl, dissolve yeast in warm water with 1 teaspoon of sugar, let stand for 5 minutes. It should bloom and make “suds”. If nothing happens, your yeast is dead. Mix in buttermilk, shortening, salt, egg and remaining sugar. Add enough flour to form a soft dough. Like most bread recipes, this will vary, so add 3 1/4 cups then add more flour as necessary until it forms a nice dough that’s not too sticky. If you accidentally add too much, just drizzle a bit of water over and work it in. Turn it out onto a floured surface and knead the dough until it becomes smooth and elastic. This should take a few minutes. Place in a greased bowl and turn so the top of the dough is oiled too. Cover and let rise until doubled in a warm place, about an hour. 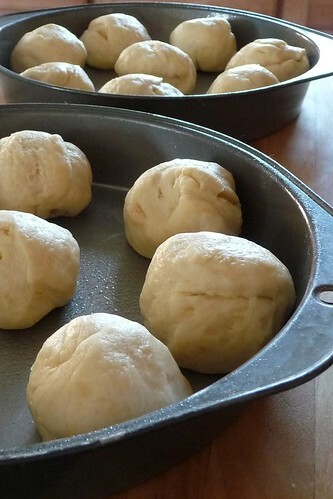 Punch down the dough and divide into 16 to 18 pieces. (Mine averaged 65g each.) Shape each piece into a ball and arrange equally in 9″ cake pans that have been lightly sprayed with non-stick spray. Make sure you leave room between them. Cover and let rise again until doubled, another 30 – 60 minutes, depending on how warm your kitchen is. Preheat the oven to 375F. 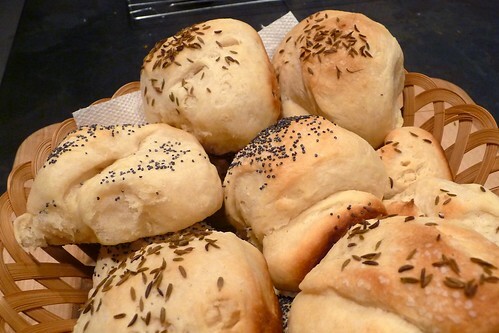 Brush the tops of the rolls with the egg white wash and sprinkle lots of poppy or caraway seeds over. I also sprinkled sea salt over the tops. Bake for 13 – 15 minutes or until golden brown. Remove to cool on wire racks. Serve warm. Always check the expiration date of your yeast. They do die and usually at the most inconvenient time. You can use melted butter instead of egg wash too. Just brush it on right before baking. This entry was posted in american, bread, recipes, side, untranslated. Bookmark the permalink.